Ed was kind enough to provide us with a portrait of Mr. Frank Ballentine, Private Investigaor. And here's Dr. Gregory Larson, played by Randall. A quick note about this episode - we're trying out some live, in-game sound effects which worked out really well. However, this required a change of recording software and the one used is a bit buggy. At times, Jim's audio is a second or so ahead of the rest of the Players'. Skype of Cthulhu presents a Call of Cthulhu scenario: The Horrible Secret of Monhegan Island, by Gary Pilkington. Published by Grenadier Models, Inc. 1984. After a dramatic, although perhaps ill-concieved, escape attempt the Investigators find themselves captured and at the mercy of the islanders. What are Mr. Martensen's intentions now? Can the Investigators find a way to break free of their captors? As is there no one else on the island to help? 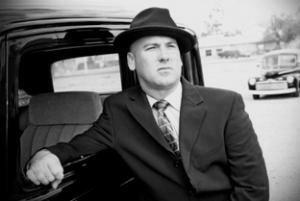 Be sure to join David, everyone's favorite investigative barber, at Ravencon 08 - 10 April, 2011 in Richmond, VA. Blocked at every turn in their search for poor Sara Goodwin, our investigators decide that they must escape from Monhegan Island before their own lives are forfeit. Will their clever ruse succeed in transporting them to safety? And is Sara thus condemned to whatever fate has befallen her with no one to come to her rescue? Sara Godwin is missing, and our investigators appear to be at a loss as to how to find her. And after throughly ransacking the Martensen household the mystery of Monhegan Island has only deepened. Will our team of heros be able to help young Sara? Or is she doomed to whatever fate awaits her ... and perhaps our investigators as well. Surrounded by unfriendly locals and with no way off the island what can be done?